Can be customized to your colors. 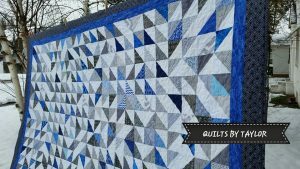 Welcome To Quilts by Taylor! And thank you for considering Handmade! Each Quilt is Unique and Hand crafted by me with love, and care to all details with professional quality. Its alive with movement from every angle you look at it! Done in Beautiful Blues and Grays in this picture, But could be ordered in other color combos. Its random in placement which gives it that unique look, each one would be a little different, or could be done in a NON random style too. Lot of variations can happen with this one.